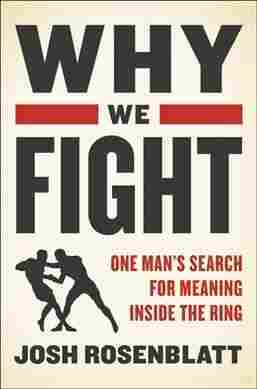 In 'Why We Fight,' One Man Searches For Self-Knowledge Through Mixed Martial Arts Josh Rosenblatt's personal meditation on fighting and selfhood is replete with engaging literary and historical excursions — giving the idea of fighting a dignity it might be harder to grant without. Fighting doesn't have to be about survival. It doesn't even have to be about pride. At least, this is what Josh Rosenblatt contends in Why We Fight: One Man's Search for Meaning Inside the Ring. He intends to impress that to fight is to know who you are in a very immediate sense. Fighting, as he sees it, is the pursuit of active self-knowledge through self-endangerment, pain and risk. It's about facing and embracing what is dangerous and, in a way, making it beautiful. To be clear at the outset, though: Why We Fight is not a celebration of violence and it's not an exaltation of a testosterone-laden self-justification. If it had been either, I'd have put it down without a second thought. Why We Fight, instead, is a fascinating story about one mixed-martial-arts fight, the training leading up to it, and what it all means to the author. It's a highly lucid, very personal meditation on selfhood, but it's also replete with a wide array of engaging literary and historical excursions — each of which gives the idea of fighting a dignity it might be harder to grant without. If it wasn't for this balance, the book might have easily slipped into either a kind of dude memoir (no thank you) or an overly Romantic abstract argument destined to be tiresome. That said, it's understandable how some skeptics still may wonder how meaningful two people inside a cage brutally battering each other really could be. The answer is "very meaningful," it turns out. Rosenblatt notes early on that he was always a "devoted pacifist with a philosopher's hatred of violence and a dandy's aversion to exercise" — until around the time he turned 33 when he decided he had had enough of self-indulgent living and wanted to impose meaningful difficulty and discipline on himself. He wanted to craft a purpose for living that wasn't merely about pleasure or self-justification: He even remarks about how his ability as a writer helped him cast what was an ultimately self-destructive lifestyle into something, on the surface, legitimate, even as it left him empty. He goes on to elaborate some on his love of words, of ideas. But he quickly turns, quite sharply, to his father, with whom he contrasts himself. It's uncomfortable, if only because the way in which he does it is very frank and direct — and continues to be throughout the book. In one passage, he writes that his father had "gifted his only son a love of words but left him alone to figure out the physical realities of life himself." Tough words. But toughness is what this book is about. One reason the idea of toughness is so compelling here is that it's bound to one of the book's recurring motifs: blood. Rosenblatt relates blood to vitality, and fighting is a sure means to their convergence. Yet, more importantly, blood is also personally revealing, and so it follows that the sight of it frightens many, owing to "the unconscious sense that anyone who sees our blood will know what kind of person we are." This is why blood is important to a fighter's identity. Fighting is a means to self-knowledge and, eventually, self-mastery. And with self-mastery surely comes a lack of fear. Fittingly, as he sees it, fights don't often become truly real for fighters until they see their own blood. He relates how "the sight of their own blood is a muse...the shock that motivates them." For most of life, blood is inside, felt but not seen. Once a fighter bleeds, what was once the province of feeling becomes vital, immediate, real. Blood aside, writing also plays a prominent role in the book — and there are many tidbits and reflections of interest that tie writing and fighting together. For example, many might not know Albert Camus and Ezra Pound sometimes boxed (not each other), the latter against Ernest Hemingway, which might not be that surprising. Rosenblatt writes that the connection between writing and fighting is undeniable in that they are "alchemical arts — the greatest writers take unmanageable life and press it into something meaningful, and the best fighters convert their basest and most violent instincts into something beautiful." Stirringly, he quotes T.S. Eliot: "The purpose of literature is to turn blood into ink." Rosenblatt shows consistent sympathy for women and people of color in fighting, though I read his tone as one that takes for granted that his experience in fighting could be (or should be) effectively universal. He mentions his sometimes-female sparring partners and he shows contempt for the brutish and likely racist attitudes he sees in some MMA fans. But there isn't much in the way of an extended consideration of how the fighting lives of women and people of color may differ from his own. Because the book is a kind of memoir/treatise hybrid, more consideration of fighters' lives fundamentally different than his own could have been helpful. Rosenblatt's consistent directness in his writing is laudable, even amidst the author's flights of fighting fancy, where he could have easily faltered into clunking dependent clause deployment and clumsy diction. And yet the most subtly successful aspect of the book might also be its greatest feature: Its steady build-up of momentum toward a mixed-martial-arts fight that should have all the trappings of a Rocky-esque drama and yet, mercifully, doesn't. When the time finally arrives — the single fight he has been working up to — there's drama. But his contemplation of fighting to this point makes the outcome of the fight itself seem like a superfluous surprise. Rosenblatt initially feels he should leave MMA after his fight, but then decides otherwise. For him, fighting is a means to a truly reflective life: one where one's life and death are uniquely precarious in their balance — a balance he needs and reveres. Nicholas Cannariato is a writer and editor based in Chicago.